Published on April 19, 2009 in 5th Summit, International and Politics. 10 Comments Tags: Barack Obama, Cuba, Fidel Castro, Fifth Summit of the Americas, Hugo Chávez, Patrick Manning, Politics, Raffique Shah, T&T Govt. BY the time this column appears in print the Summit will be almost over. The 34 heads of governments will have had their say, hopefully in a civil manner. Hugo Chavez has indicated he would insist on the US trade blockade of Cuba be addressed in the document. Canada, too, is not happy with it, albeit for other reasons. 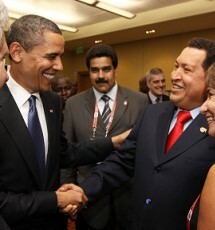 What I found distasteful about the media pre-Summit hype was the focus on Chavez and US President Barack Obama at the expense of other leaders.